It's hard for someone who is a huge fan of the books to be happy with the show's divergent plotline. While show-only fans have to check in with book readers to get clarification on some points, book-readers are saddened by the absence, alteration, and combination of characters. Combine these issues and it is hard for a book reader to review the show without a great pile of annotations and footnotes. Since Jon Snow was given the Julius Caesar treatment in the books, people have speculated that (a) he wasn’t dead or (b) he would be resurrected by some means. There were long arguments about prophecies that are prominent in the books but not even fully articulated in the show. A great many fan theories converged on the place and moment when the knives came out. Many of those doors were closed by the absence of whole characters, events and story-lines in the show. To complicate things further, the stabbing scene in was a A Dance with Dragons hidden homage to American Football where metaphorical New York Giants tore the metaphorical Dallas Cowboys limb from limb. Certain British nerds were very buttsore “How dare he cheapen this great work of literature with your American game,” I remember one writing. I don't know how to order a pizza for his buttsore across the Atlantic. It was speculated, based on the Azor Ahai prophecy, Jon Snow would be resurrected, or more importantly reborn, by the hand of Melisandre. Since this is the show, not the books, show watchers may not know that there is more to the prophecy than a birth or re-birth. Melisandre said her words. She cut Jon's hair. She said some more words. Nothing happened. Everybody leaves the room. Jon is reborn. It looks like her magic was not as strong as when she was using “king's blood” like Gendry's leeched blood or Stannis's seed. The only sacrifice made was Jon's hair. Thus the prophecy has been fullfilled, the sacrifice has been made, Azor Ahai is reborn. 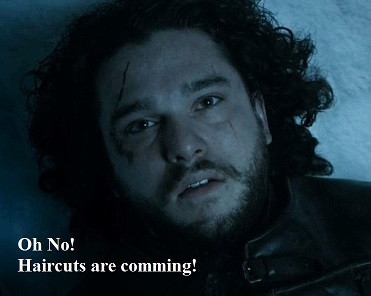 Sorry fangirls, the Prince that was Promised loves his hair more than you. But at least you didn’t get stabbed through the heart with a red hot sword.